Curtis Lumber is where you will find the best Creative Custom Kitchen design centers in Upstate New York and Vermont. 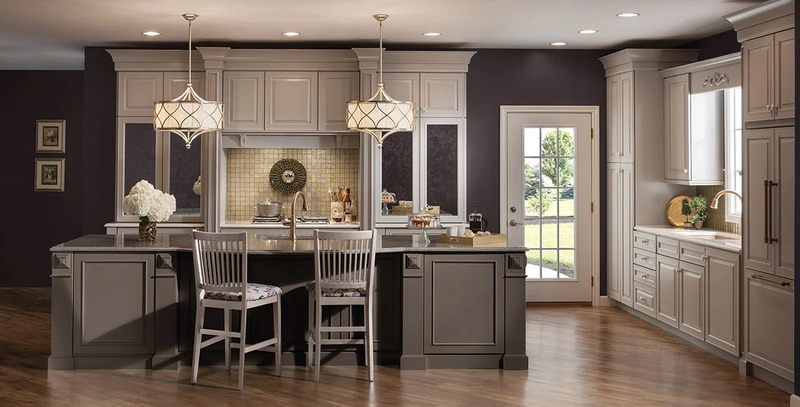 With an extensive selection of Merillat kitchen cabinets in the most popular woods and finishes, there is no doubt that you will find the kitchen cabinets you've been dreaming about. We feature many stylish, fully decorated kitchens onsite at each location's unique kitchen design showroom, so you'll be able to see and touch the different kitchen cabinets available. More importantly, Curtis Lumber Kitchen Design Showrooms feature the best designers in the industry. When you enlist the helpful advice and expertise of a National Kitchen and Bath Association Certified kitchen designer at Curtis Lumber, your dream kitchen no longer has to exist only in your imagination. With carefully planned and executed kitchen designs, our experts can help make your vision a reality with our selection of finely-crafted Merillat cabinetry, countertops, hardware and fixtures. A picture may be worth a thousand words, but the ability to experience our extensive selection of kitchen cabinets firsthand is priceless! You'll find that a dash of design and a pinch of functionality is the recipe for a kitchen that truly makes you feel at home. Our Showroom Centers in Upstate New York and Vermont can help you achieve your vision for the perfect kitchen cabinets or kitchen design . Select a location close to you and take advantage of the special offer with the purchase of a kitchen design package. This premier showroom is located in Curtis Lumber's largest store location in Ballston Spa, NY. It features more than a dozen beautifully designed and well appointed display kitchens as well as an extensive' dedicated design staff of over 100 years of kitchen design experience. The store also features weekend and evening hours for your convenience. The Schuylerville showroom demonstrates the full features available in kitchen design. Serving Chenango county, Oneonta, and beyond, this Southern Tier showroom has numerous locally inspired displays perfect for any home. Located minutes away from Colgate University, our Hamilton showroom features a kitchen display to illustrate what is available from our design services. Our newly remodeled, 2,000 square foot showroom displays over 6 fully functional kitchen displays with all of the newest trends in kitchen design incorporated. Conveniently located off exit 11E of I-90, Curtis Lumber's East Greenbush showroom is a hidden gem in Rensselaer County. Our tastefully designed Perth showroom displays over 7 fully decorated kitchens. A true "Adirondack gem," our Ray Brook showroom combines the rustic and contemporary to show what can be achieved with true kitchen design. Conveniently located across the street from the Champlain Centre mall on Tom Miller Road is our Plattsburgh kitchen showroom. On Pine Street, just south of Church Street in Burlington, lives our recently redesigned Kitchen Showroom. This showroom features 7 beautifully decorated displays to fit any home. Each Curtis Lumber Kitchen Cabinet Showroom Location features state-of-the-art cabinet design software. This allows your kitchen cabinet designer to develop a 3 dimensional rendering of your project and provides a level of planning to your builder that others may not be able to. You will find that the kitchen cabinet design staff also has access to a number of beautiful cabinet samples from leading kitchen cabinet manufacturers, countertop choices, faucets, sinks and much more to help you visualize your new kitchen cabinets. Ever feel like you can imagine what you like but once you try to describe it, others just do not understand? When planning your dream kitchen, visiting a Curtis Lumber kitchen cabinet showroom and meeting with a kitchen cabinet designer will help you to see feel and touch kitchen cabinets, countertops, and other finishes. This will help you describe what you want for kitchen cabinets to your designer and your kitchen cabinet designer can show you all of the latest trends and teach you little known facts about kitchen cabinets and kitchen cabinet design. Curtis Offers Complete Value and Service When It Comes To Your Kitchen or Bath! We will coordinate with your builder/countertop fabricator for you! We are writing to let you know how pleased we are with our gorgeous new kitchen design and the talented people you have working for you. Carrie designed a highly functional, beautiful kitchen with all the bells and whistles. She has a great sense of style and a no pressure approach. She did a fantastic job and was a pleasure to work with. Your Kitchen Designer Paul was my true savior when purchasing my kitchen! He guided me through the entire process and was quick to tell me when something would not work and explain why, as well as offer suggestions that I had not even considered. My entire experience from beginning to end with Paul as well as Curtis Lumber in general was the best experience I've had with a company in a very long time. Thank you so much for my beautiful kitchen. Please extend a "Thank you" and a pat on the back to Scott. I spoke with Scott about cabinet and countertop options for kitchen renovations we are doing. He was knowledgable, provided good input, and suggested a few contractors who do the job right. We bought the Merillat cabinets and Cambria Quartz Countertop from your location, and our contractor frequently visited your store on our behalf. It was a great one-stop experience for our new "kitchen design" project. We recently finished our fantastic kitchen remodel using Curtis Lumber Co. Having worked for a prominent builder, I knew Curtis was where we wanted to go. We have never done anything like this before. The result is this beautiful and functional kitchen design. The main reason it is so spectaclar is because of Jacques, the kitchen designer. We did not know where to begin but Jacques held our hands throughout the kitchen design process. Jaques was with us every step of the way; from kitchen design to cabinet selection to help with installation. We could not be happier. This is truly the kitchen of our dreams. We marvel every time we look at the details Jacques recommended crown Moulding, soft close drawers, deeper sink... We can't stop smiling. I remodeled our kitchen last year and with the help of Jodie, from start to finish, it turned out great. We had one issue with the sink and she quickly made sure I was taken care of. Her attention to detail is something you don't run across too often in your business of kitchen design. She certainly knows her business and she is a pleasure to work with.